Fried Chicken | Get Your Grub On! Taiwan’s Famous Fried Chicken In Singapore! Since a friend told me about this place in Taipei I wanted to try it, so when they opened a shop in Singapore my mission was clear. 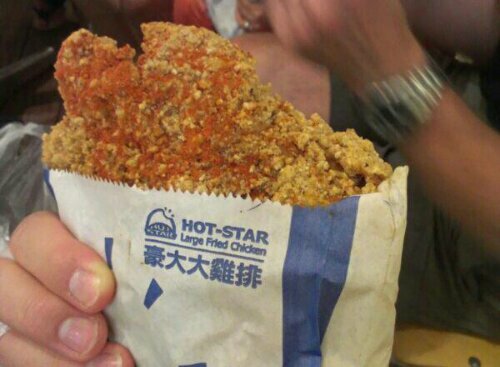 When we went I ordered the “Spicy Chicken” with “Garlic Fries”. They fry up everything the same way and later sprincle different spice mixes on chicken and fries to give them their individual taste. My chicken was not too hot and quiet tasty on the breast part. To my surprise I found some neckbones in mine but the portion was generous enough to fill me up good anyway. The fat is well drained so the chicken does not taste greasy at all but comes along a tad dry because of the powder spice mix. Mine was alright together with a drink but my friend blew off garlic powder clouds everytime he took a bite. All in all a nice junkfood alternative but far from a culinary epiphany.